A headboard can make a bold statement in any bedroom, it may accent the decor style and colors you are using. 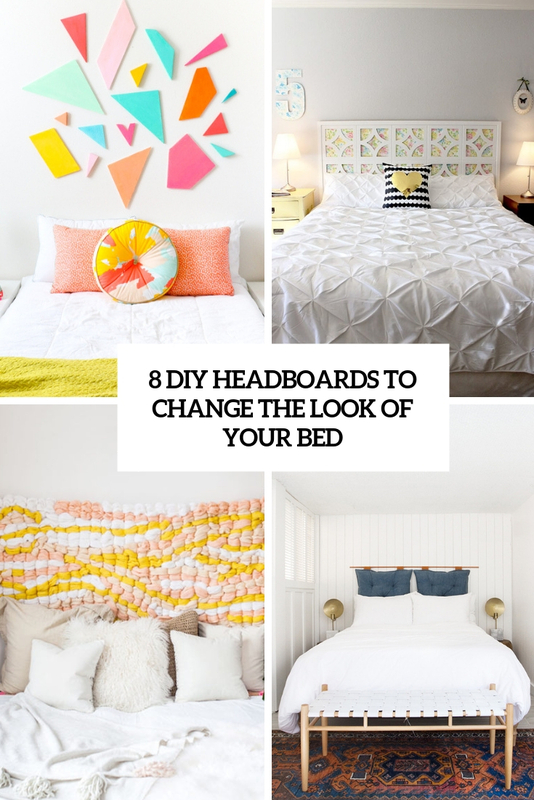 If your bed doesn’t feature a headboard or it doesn’t match your space, you may DIY one. 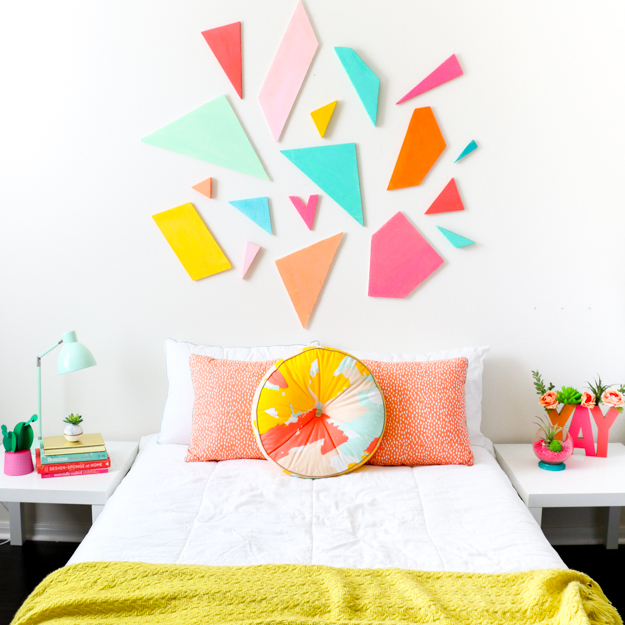 Here are some easy tutorials to make a bold and creative headboard, get inspired! 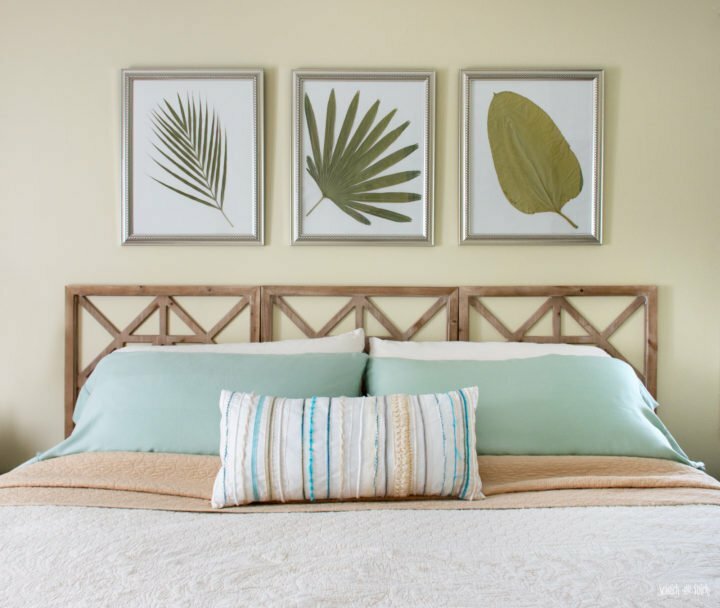 The first project is technically not a headboard but an artwork on the wall, though we may call it a headboard, too, as it’s right over the bed. Everything from hexagons to triangles have become popular in the last few years, and you’ll see them all in the resulting art. I am kind of obsessed with the shapes and colors, and I hope you’ll be obsessed, too, enjoy! 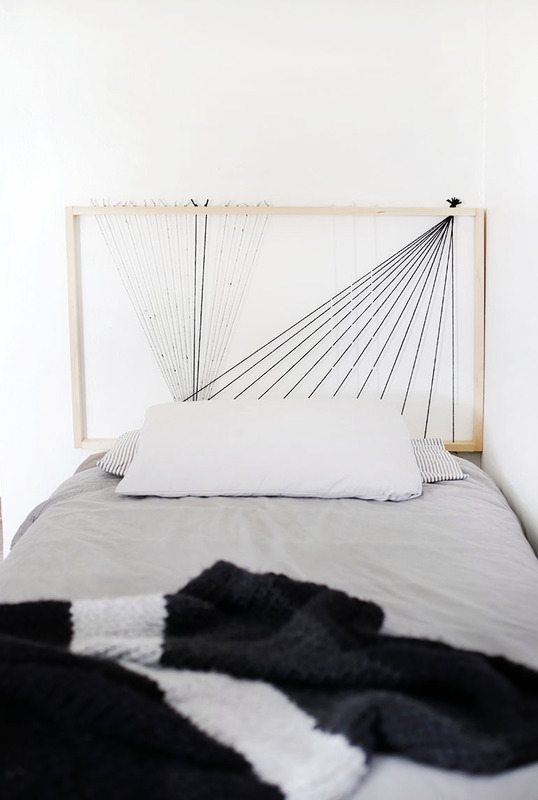 String art pieces are very popular now, so why not turn your headboard into a string art piece? 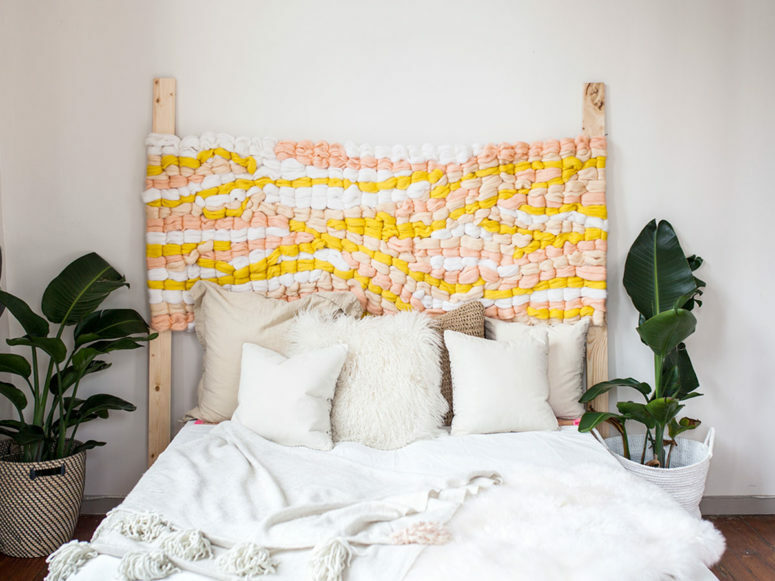 Such a headboard will be a nice idea for a minimalist, Scandinavian or just contemporary bedroom, and you may vary the color of the strings you use. You can either attach the headboard directly to the wall or attach it to your bed frame, enjoy! Color blocking is a very trendy idea to add color to your space, and of course you may implement it wherever you like including bedrooms. This painted color block plywood headboard is a fun idea to add a touch of color to your sleeping space and crafting it is very easy. Vary the colors as you want and make your bedroom trendy and bright! Vintage frames easily bring a refined feel to any space, however you use them. 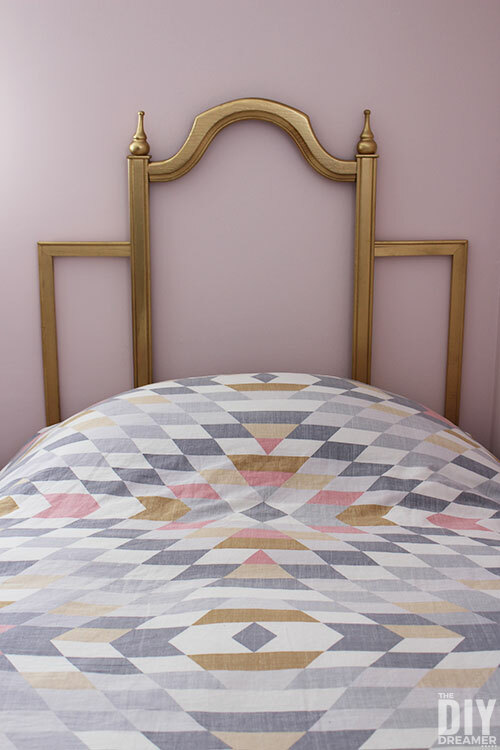 Learn how to upcycle a frame into a headboard with this step by step tutorial – it’s very quick and easy to make! Such a gorgeous and exquisite headboard will make your bedroom sophisticated. When the piece is ready, put the headboard in the desired location and push the bed against it. If the headboard sits too low, place 4x4s on the floor and place the headboard on top. 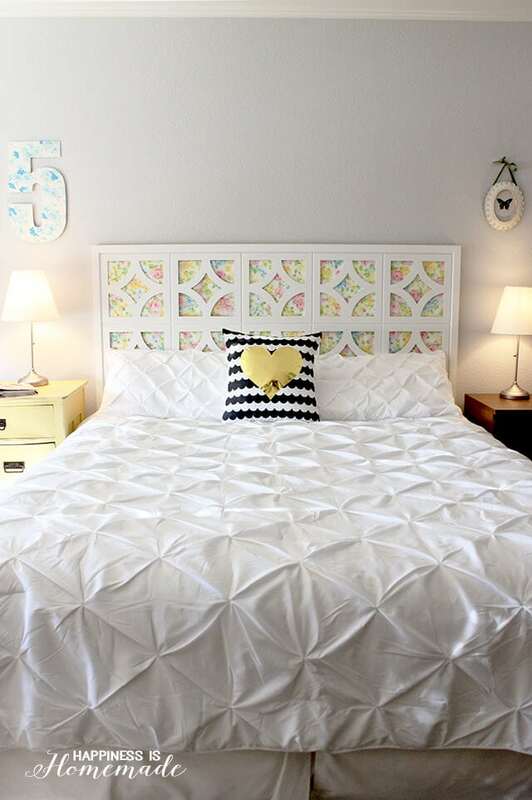 You can make yourself a DIY Headboard out of just about any decorative wall panels. Take a few measurements and attach the panels to the wall at the head of your bed. 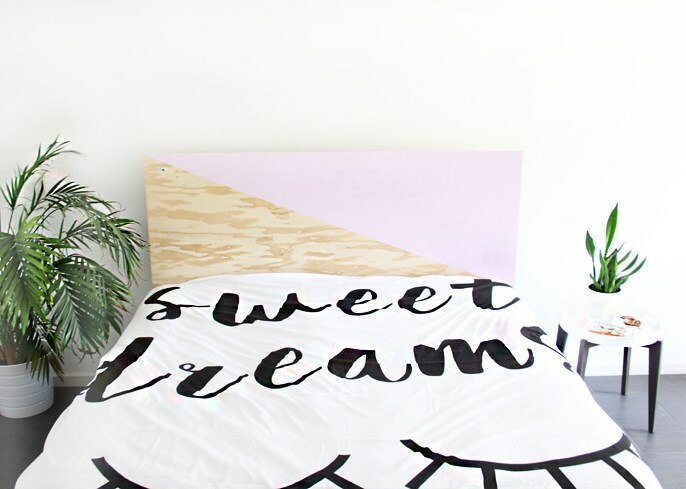 This headboard DIY project is easy to complete, can be installed in less than an hour, and it’s affordable! You may also paint the panels as you like if you wanna add a touch of color to the bedroom. This pretty and colorful headboard is made of MDF cutouts and vintage floral sheets. It will make your bedroom bright, chic and a bit vintage, and such a headboard can be styled and restyled as many times as you want – just change the fabric underneath the panels. 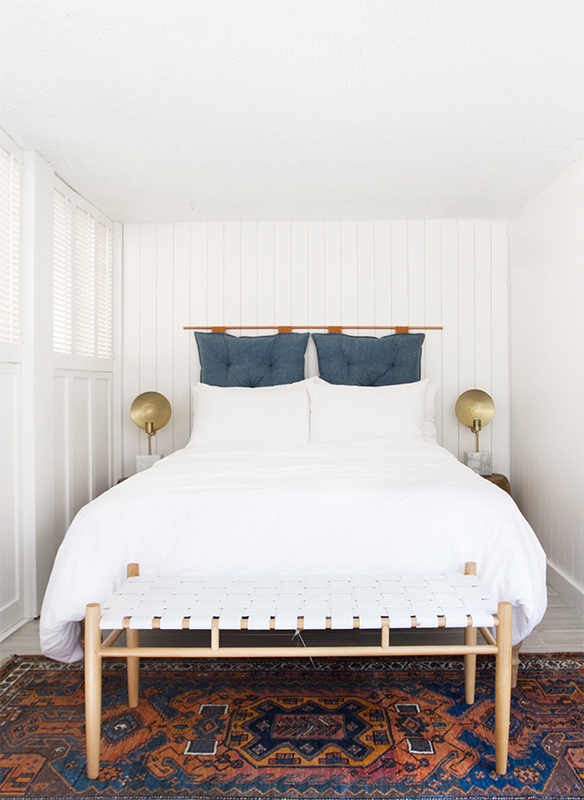 If you need a headboard idea with a relaxed and modern feel, here’s a proper tutorial! This project will tell you how to make a cool modern headboard with cushions that will make reading in bed super comfortable. I totally love the combo of denim cushions, a copper holder and leather loops, if you too – just head over to the source to make it.